As Tiny Tim proved in Dickens’s A Christmas Carol way back in the 1800s, we are fascinated by things in miniature. Take a character, make ’em small, and…BOOM…instant attachment. So, if a crippled young Pollyanna is enough to move our hearts, what about a miniature action hero? A living, breathing 5 inches of pure tactical fury to be exact. This is Bruce. A very dark, but very funny take on a technology that allows you to synthesize your very own John McClane. Told in a distinctive, hand drawn animation style by Tom Judd, Bruce manages to walk an interesting line between “golly-gee-that’s-cool” to “this-is-utterly-disturbing.” In other words, it’s awesome. 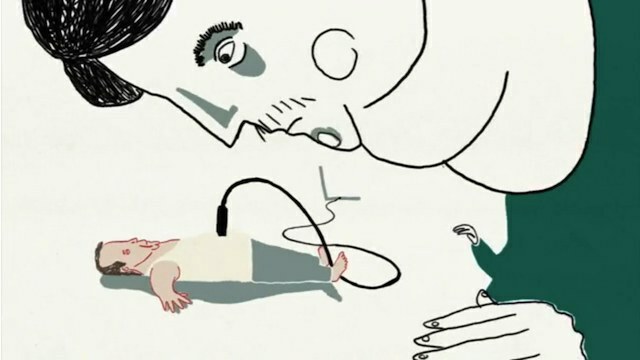 Bruce is Judd’s 2009 graduation film from the Royal College of Art, and since its online release, the short has received considerable attention, including license by MTV’s Liquid Television. The film’s juxtaposition of tones–the goofy combined with the sardonic–gives the film an unmistakeable personality. It’s Beavis and Butthead via Jonathan Swift—a morality tale without an ounce of moralizing, told with engaging line work and a defined color palette. But, as compelling as Bruce‘s visuals are, they were created with an astonishingly simple technique. Judd literally hand drew each frame in Photoshop, layer by layer, to construct each shot. For the more complex camera movements, he used a rough export from a 3D program and rotoscoped each frame. It’s a time consuming method to be sure, but it gives Bruce an intentionally messy vibe, a look that stands in intriguing contrast to the film’s technology-driven premise. Music–or its lack thereof–plays yet another interesting aesthetic role. Hollow, empty drones mirror our lead protagonists cold indifference. With each amazing action on screen, he remains a stoic representation of a society that no longer maintains the capacity to be impressed or moved. When viewed on a deeper level, the aesthetics give way to a more cerebral take on a multitude of subjects. Scientific ethics, playing God, the dehumanizing nature of technology, modern day apathy–even a casual viewer can tell all of it’s on full display. But Bruce, like the best short films, deals with these topics subtly, never lingering on any subject to where its dissection becomes ham-fisted. The topics are there. Sermons aren’t. And, really, that may be Bruce‘s crowning achievement, turning what could just be a colorful one note joke into something that lasts far beyond its short 3 minute runtime. God bless us everyone, indeed.